This is the first book about ghosts we've been asked to review. 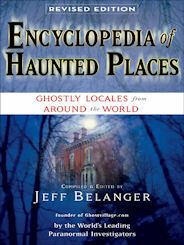 It is a compilation of short reports on various reputedly haunted locations across the world. Well, in fact there's a strong bias towards reports from the USA, where the majority of the contributing researchers, and indeed the book's editor, live. In a way, the demographics of the book reflect those of the Internet as a whole, which is unsurprising given the book's link with the highly successful Ghostvillage.com. The book makes for an interesting read, ironically made all the more intriguing for the European reader by this American bias. All haunted places have a history to discover, often giving a sense of context to an encounter, and sometimes providing an explanation for a particular manifestation. Because the post-Columbus history of the United States is uncommonly short, the available historical context surrounding any given location is much more limited than elsewhere in the Old World. Yet, reading this book one could be forgiven for wondering whether ghosts are as common in the States as elsewhere: which is a sobering thought. Many of the haunted locations cited by the book's researchers are associated with the American Civil War, and the book actually provides a pretty good historical overview of that conflict, albeit in jigsaw form. The various tales of woe attributable to that war are instructive and even poignant. I've learned a lot about American history from the pages of this book, which is a tribute to the knowledge and learning of its various contributors. They have done an excellent job of tying up diverse strands of research when investigating individual haunted places. This work has then been thoughtfully assembled and presented by Jeff Belanger, in the end providing us with a good source book, and an entertaining read. I should once again draw attention to the geographical imbalance of the book, however. The book certainly does not claim to be exhaustive (how could it? ), but the 'Rest of the World' is rather confined to the last quarter of the book. I think it would have been better to concentrate entirely on the North American continent. This would have made the book more useful to a traveller in the USA and Canada seeking out these various locations who, I suspect, would be unlikely to venture beyond North American shores (the majority of Americans don't possess, or desire, a passport). Also, the book makes the mistake of including haunted locations in the Republic of Ireland (Malahide Castle and Saint Catherine's Abbey) within the chapter headed 'United Kingdom'. Whoops. I can sense the republican ghosts of Eire turning in their graves...But, most of all, if the book concentrated solely on North America it would not give the sense of the U.S. being the ghost capital of the world, which it most certainly isn't! That said, there is a lot of merit in this book, and I would recommend it. The research is well-written up; not going into laborious detail, and thoughtfully lightened up in such a way as to capture the imagination of the casual reader. It highlights the diligence of many small research groups spread across the world, and shows us the breadth of expertise contained within the paranormal community as a whole. It is to the credit of Jeff Belanger that he has selflessly provided the opportunity for so many ghost-hunters to get their reports in print, alongside more celebrated colleagues. The book also travels off-road, visiting some pretty bizarre locations, like run-down diners and obscure cemeteries in the middle of nowhere. In Britain, ghost stories are often associated with pubs, castles and old manor houses. To read of haunted creeks is really pretty novel. It seems that the relative short history of the USA does not prevent this great country having its fair share of ghosts. If you buy this book you'll know just where to find them.